This is an Allegheny Mound Ant. Allegheny Mound Ants are multi-colored ants that have a brownish or off-red front-half and black or darkish brown back-half. 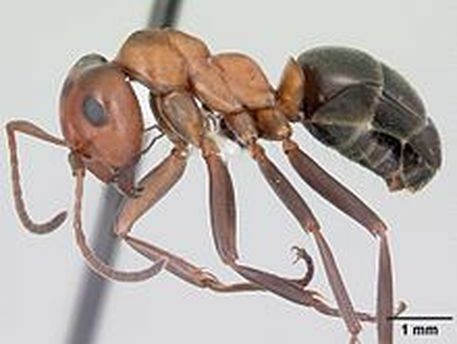 These ants build mounds and tunnel down to about 3 feet in softer soils. Sense Allegheny Mound Ants dig so deep they "mound" the dirt on the surface, and that's how they get their name. Allegheny Mound Ants are seldom found in homes, mainly because they cannot dig their mounds into your carpet or hardwood floors, but they can be found outside around the house, especially if you have a lot of field type grass or wooded areas. You can find them under decks as well because they can dig down and come up to find any food that may have been dropped by people. They can also make an easy meal out of pet food. What do Allegheny Mound Ants eat? Allegheny Mound Ants prefer sweet foods and will be happy to clean up after a picnic if you drop any deserts or globs of ketchup (which contains corn syrup). How do Allegheny Mound Ants get into my home? The good news is that Allegheny Mound Ants are not likely to want to come in your home. They are more happy digging in the dirt and stopping by from time to time for a short visit. How do I get rid of Allegheny Mound Ants? Allegheny Mound Ants are generally not the home invading species so if you have an ant problem these little guys are most likely not it. They can however damage trees and other plants by spraying them with formic acid, so if you notice ants in the garden and your plants are dying, or trees are getting killed then call us for an inspection and we will be happy to help you out. Click here to learn more about Argentine Ants!